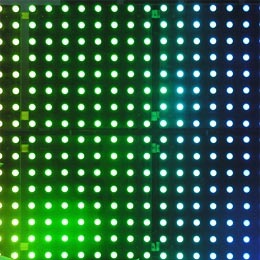 Aptly named the MEGA VIP 256™, is a newly developed system of LED pixel screens that creates new possibilities for LED screens with ease of simplicity and cost effectiveness. Each screen is comprised of 16 x 16 LED CLUSTERS with each LED CLUSTER representing a single pixel in so that the MEGA VIP 256™, acts as an extension to your PC monitor. 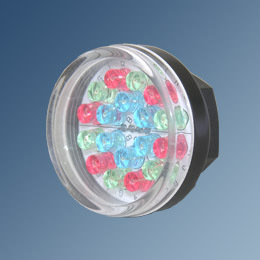 Each LED CLUSTER contains 6 red, 6 blue and 6 green LEDS giving out a high light output at each pixel. 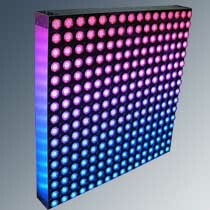 The system enables an independent control of red, blue and green LEDS resulting in almost limitless RGB color mixing. Total and precise color calibration of each pixel is designed to achieve a perfect color harmonization of the entire panel. Display video, animation images, flash files, text or any format that can be displayed on your PC. 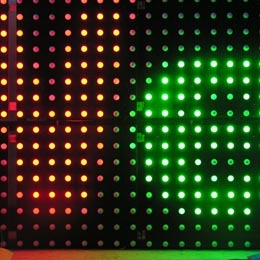 The MEGA VIP 256™, is a 1006 x 1006 X 115 mm modular LED panel designed for multi application (Patent Pending). Owing to its innovative concept, MEGA VIP 256™ is perfectly suitable for advertising and promotion, TV Studios, conventions, stadiums, theme parks as well as architectural, retail, display, signage and entertainment applications. The exclusively 120° angle image diffusion system of MEGA VIP 256™ allows for a wider angle vision of the screen. The system’s resolution allows displays up to 32 x 16 meter spread over a total of 512 square meters or even up to 32 x 32 meter spread over a total of 1024 square meters depending on the extra drivers added. MEGA VIP 256™’s control system can operate each individual panel as a portion of the standard video screen. - LONG RANG TRANSMISSION- HIGH SPEED DATA TRANSMISSION ALLOWS THE USER TO CONTROL THE MEGA VIP 256 FROM DISTANCE OF OVER 100 M (FACTORY TESTED AT 130 M).